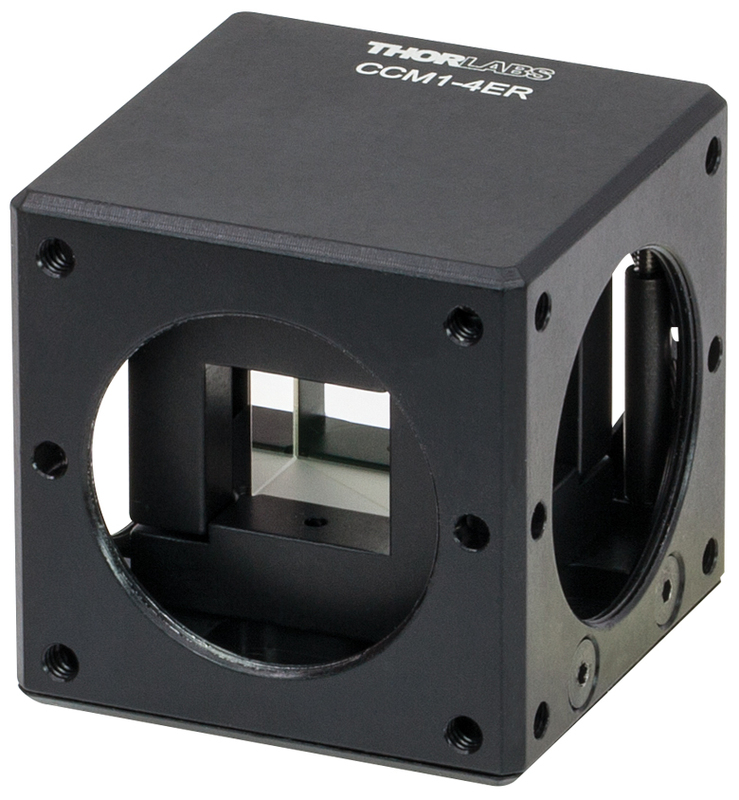 BS004 1 50:50 Non-Polarizing Beamsplitter Cube, 400 - 700 nm, 1/2"
Thorlabs' non-polarizing beamsplitter cubes are offered here with broadband AR and beamsplitter coatings designed for 400 - 700 nm. These cubes provide a 10:90, 30:70, 50:50, 70:30, or 90:10 beamsplitting ratio with a minimal dependence on the polarization of the incident light (see the tables below for the polarization split ratio tolerances). Each cube is fabricated from N-BK7 and designed for minimal beam offset. A single reflecting surface also avoids ghost images. The dielectric beamsplitter coating is applied to the hypotenuse of one of the two prisms that make up the cube. Then, cement is used to bind the two prism halves together. These cubes are engraved with arrows that indicate the direction in which the beam is incident on the beamsplitter coating layer, as shown in the diagram to the right. Although light can enter through any of the other AR-coated surfaces, specifications are guaranteed when light is first incident on the side of the beamsplitter coating; see the diagram to the right. Please refer to the BS Cube Mounting tab above for information on mounting options and compatibility. 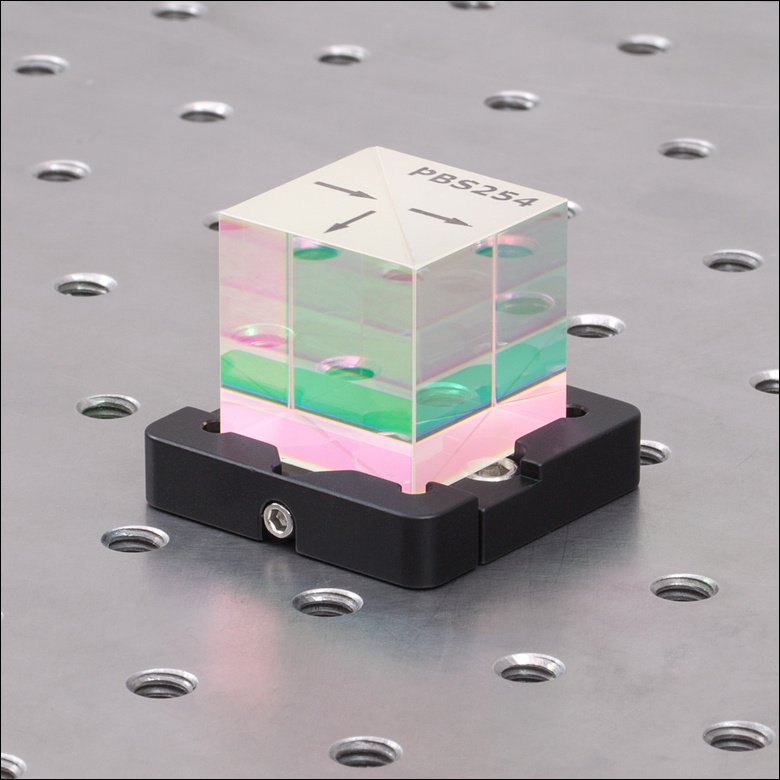 Alternatively, we offer mounted 1" non-polarizing beamsplitter cubes and 20 mm non-polarizing beamsplitter cubes. 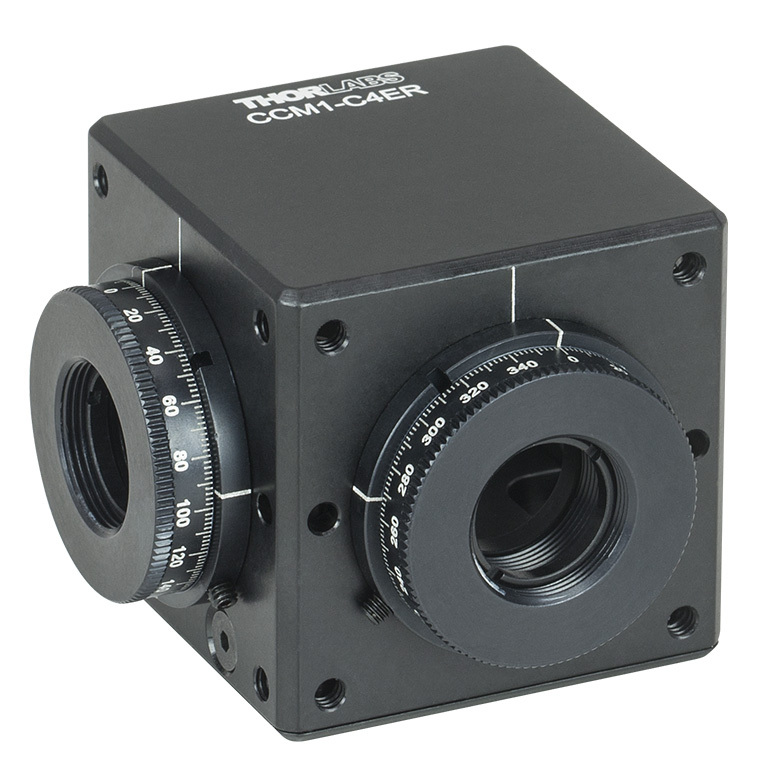 The 1" cubes are mounted inside 30 mm cage compatible cubes, each of which features four SM1-threaded (1.035"-40) access ports, while the 20 mm cubes are mounted within 16 mm cage compatible cubes, each of which features four SM05-threaded (0.535"-40) access ports. 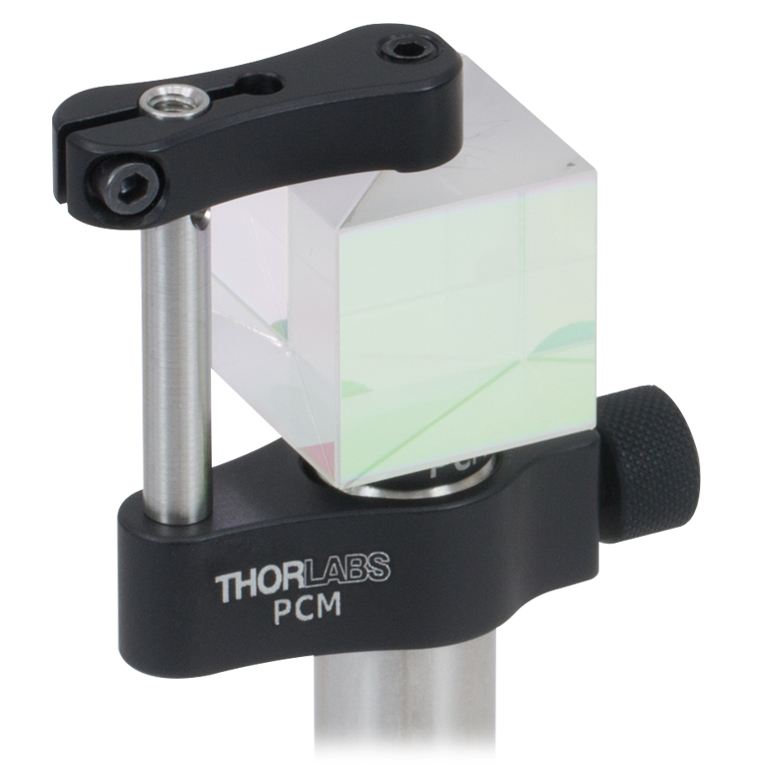 Additionally, Thorlabs offers pellicle beamsplitters (cube mounted and ring mounted) and plate beamsplitters. For a direct comparison of the performance of our non-polarizing beamsplitter cube, plate, and pellicle at 633 nm, see the Lab Facts tab. 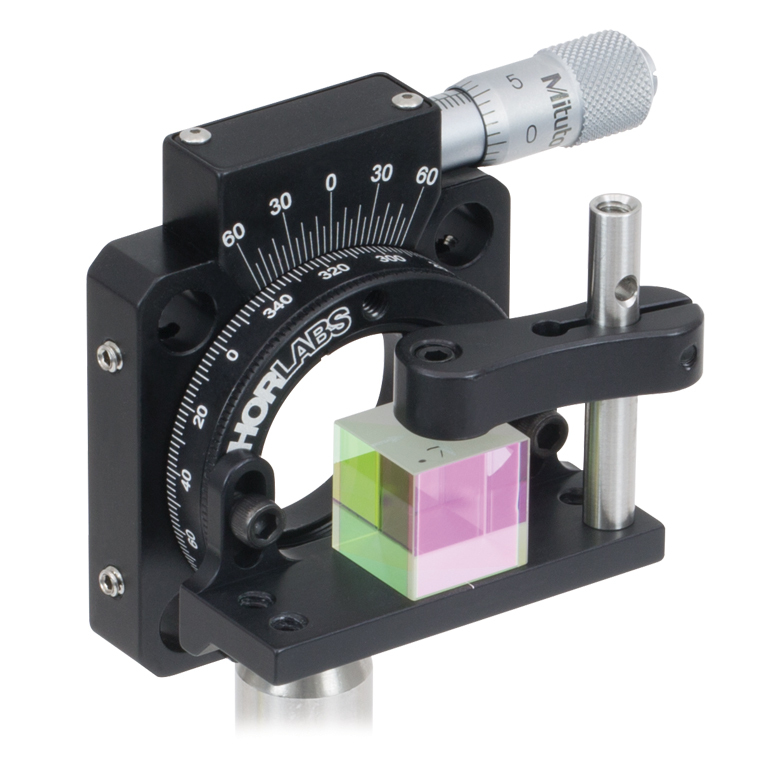 This cube fits our FiberBench Tip/Tilt Rotation Mount. 0° AOI and over the 400 - 700 nm AR coating range, unless otherwise specified. We present laboratory measurements of the polarization angle, split ratio, and total throughput power of a beam transmitted through Thorlabs plate, cube, and pellicle beamsplitters. While all non-polarizing beamsplitters function similarly, the exact performance is different for different types of beamsplitter. Each type of beamsplitter contains its own advantages and disadvantages compared to other types of beamsplitters. Appropriate choice of beamsplitter is essential to sensitive experimental systems. We present a complete analysis and comparison of optical parameters for three common types of non-polarizing beamsplitters. For our experiment we used the former generation HRS015 stabilized HeNe laser (replaced by the HRS015B) as the light source for our investigation. A linear polarizer is used to set the laser beam's polarization axis to 45° in order to provide equal S- and P-polarized light incident on the beamsplitter. The beamsplitter under investigation was then placed in the beampath, and its split beams directed to appropriate detectors. The total power though the optic, polarization states, split ratios, and angle of incidence effects were investigated under this configuration. The plots below summarize the measured results for all three types of beamsplitters. From these graphs the performance of each optic can be easily compared to one another. The bottom left plot summarizes the results for the total power throughput for each optic. The total power throughput is measured as the fraction of input power. While the plate and pellicle beamsplitters perform rather similarly, the cube shows signs of absorption inside the optic. Additionally, this plot shows the relative insensitivity of throughput power to angle of incidence. The bottom middle graph summarizes the results for the output polarization angle for each optic. The cube shows the most similar polarization angles between the reflected and transmitted beams, with the plate producing the largest difference in polarization between beams. The bottom right plot summarizes the results for the split ratio, as a fraction of input power, for the beamsplitters. Here it can be shown that the plate beamsplitter demonstrates the most ideal for 50/50 power splitting. For details on the experimental setup employed and the results summarized here, please click here. These values only apply to the 50:50 cube beamsplitters sold on this page. The others have not been tested. The power density of your beam should be calculated in terms of W/cm. For an explanation of why the linear power density provides the best metric for long pulse and CW sources, please see the "Continuous Wave and Long-Pulse Lasers" section below. The specifications to the right are measured data for Thorlabs' 50:50 non-polarizing cube beamsplitters with a wavelength range from 400 to 700 nm. 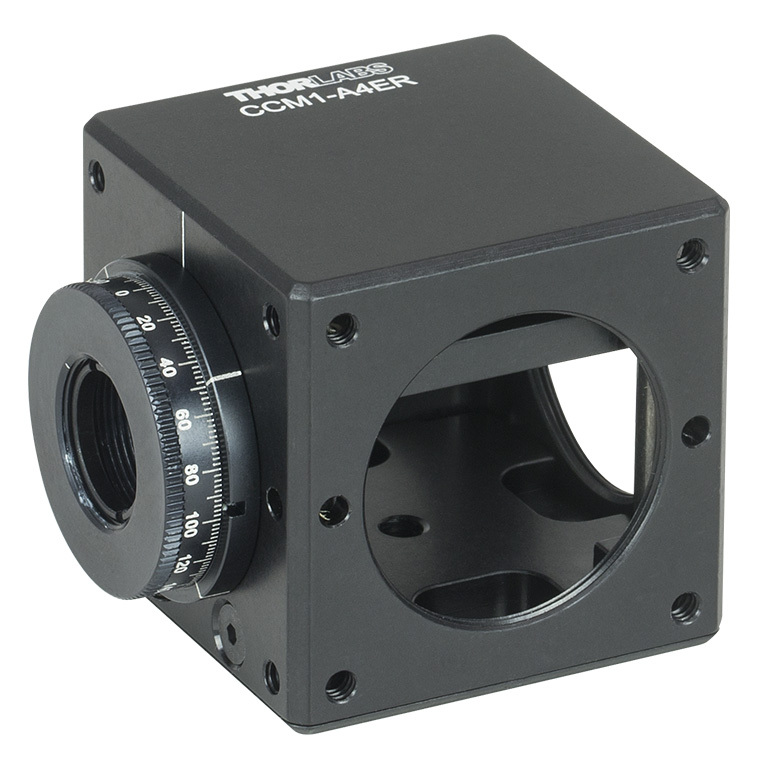 Damage threshold specifications are constant for all 50:50 cubes, regardless of the size of the beamsplitter. Please note that we do not have damage threshold data currently available for the cubes on this page that offer other splitting ratios. The following is a general overview of how laser induced damage thresholds are measured and how the values may be utilized in determining the appropriateness of an optic for a given application. When choosing optics, it is important to understand the Laser Induced Damage Threshold (LIDT) of the optics being used. The LIDT for an optic greatly depends on the type of laser you are using. Continuous wave (CW) lasers typically cause damage from thermal effects (absorption either in the coating or in the substrate). Pulsed lasers, on the other hand, often strip electrons from the lattice structure of an optic before causing thermal damage. Note that the guideline presented here assumes room temperature operation and optics in new condition (i.e., within scratch-dig spec, surface free of contamination, etc.). Because dust or other particles on the surface of an optic can cause damage at lower thresholds, we recommend keeping surfaces clean and free of debris. 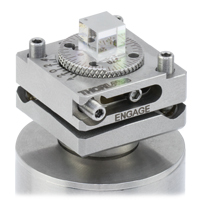 For more information on cleaning optics, please see our Optics Cleaning tutorial. Thorlabs' LIDT testing is done in compliance with ISO/DIS 11254 and ISO 21254 specifications. First, a low-power/energy beam is directed to the optic under test. The optic is exposed in 10 locations to this laser beam for 30 seconds (CW) or for a number of pulses (pulse repetition frequency specified). After exposure, the optic is examined by a microscope (~100X magnification) for any visible damage. The number of locations that are damaged at a particular power/energy level is recorded. Next, the power/energy is either increased or decreased and the optic is exposed at 10 new locations. This process is repeated until damage is observed. The damage threshold is then assigned to be the highest power/energy that the optic can withstand without causing damage. A histogram such as that below represents the testing of one BB1-E02 mirror. The photograph above is a protected aluminum-coated mirror after LIDT testing. In this particular test, it handled 0.43 J/cm2 (1064 nm, 10 ns pulse, 10 Hz, Ø1.000 mm) before damage. According to the test, the damage threshold of the mirror was 2.00 J/cm2 (532 nm, 10 ns pulse, 10 Hz, Ø0.803 mm). Please keep in mind that these tests are performed on clean optics, as dirt and contamination can significantly lower the damage threshold of a component. While the test results are only representative of one coating run, Thorlabs specifies damage threshold values that account for coating variances. When an optic is damaged by a continuous wave (CW) laser, it is usually due to the melting of the surface as a result of absorbing the laser's energy or damage to the optical coating (antireflection) . Pulsed lasers with pulse lengths longer than 1 µs can be treated as CW lasers for LIDT discussions. When pulse lengths are between 1 ns and 1 µs, laser-induced damage can occur either because of absorption or a dielectric breakdown (therefore, a user must check both CW and pulsed LIDT). Absorption is either due to an intrinsic property of the optic or due to surface irregularities; thus LIDT values are only valid for optics meeting or exceeding the surface quality specifications given by a manufacturer. While many optics can handle high power CW lasers, cemented (e.g., achromatic doublets) or highly absorptive (e.g., ND filters) optics tend to have lower CW damage thresholds. These lower thresholds are due to absorption or scattering in the cement or metal coating. LIDT in linear power density vs. pulse length and spot size. For long pulses to CW, linear power density becomes a constant with spot size. This graph was obtained from . Pulsed lasers with high pulse repetition frequencies (PRF) may behave similarly to CW beams. Unfortunately, this is highly dependent on factors such as absorption and thermal diffusivity, so there is no reliable method for determining when a high PRF laser will damage an optic due to thermal effects. For beams with a high PRF both the average and peak powers must be compared to the equivalent CW power. Additionally, for highly transparent materials, there is little to no drop in the LIDT with increasing PRF. 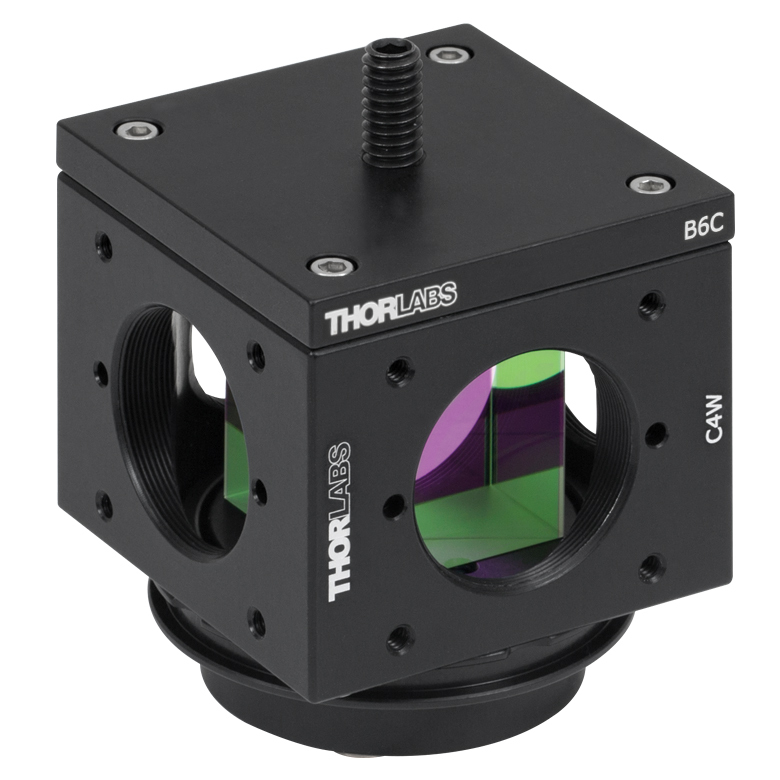 Thorlabs expresses LIDT for CW lasers as a linear power density measured in W/cm. In this regime, the LIDT given as a linear power density can be applied to any beam diameter; one does not need to compute an adjusted LIDT to adjust for changes in spot size, as demonstrated by the graph to the right. Average linear power density can be calculated using the equation below. The calculation above assumes a uniform beam intensity profile. You must now consider hotspots in the beam or other non-uniform intensity profiles and roughly calculate a maximum power density. For reference, a Gaussian beam typically has a maximum power density that is twice that of the uniform beam (see lower right). While this rule of thumb provides a general trend, it is not a quantitative analysis of LIDT vs wavelength. In CW applications, for instance, damage scales more strongly with absorption in the coating and substrate, which does not necessarily scale well with wavelength. While the above procedure provides a good rule of thumb for LIDT values, please contact Tech Support if your wavelength is different from the specified LIDT wavelength. If your power density is less than the adjusted LIDT of the optic, then the optic should work for your application. Please note that we have a buffer built in between the specified damage thresholds online and the tests which we have done, which accommodates variation between batches. Upon request, we can provide individual test information and a testing certificate. The damage analysis will be carried out on a similar optic (customer's optic will not be damaged). Testing may result in additional costs or lead times. Contact Tech Support for more information. As previously stated, pulsed lasers typically induce a different type of damage to the optic than CW lasers. Pulsed lasers often do not heat the optic enough to damage it; instead, pulsed lasers produce strong electric fields capable of inducing dielectric breakdown in the material. Unfortunately, it can be very difficult to compare the LIDT specification of an optic to your laser. There are multiple regimes in which a pulsed laser can damage an optic and this is based on the laser's pulse length. The highlighted columns in the table below outline the relevant pulse lengths for our specified LIDT values. Pulses shorter than 10-9 s cannot be compared to our specified LIDT values with much reliability. In this ultra-short-pulse regime various mechanics, such as multiphoton-avalanche ionization, take over as the predominate damage mechanism . In contrast, pulses between 10-7 s and 10-4 s may cause damage to an optic either because of dielectric breakdown or thermal effects. 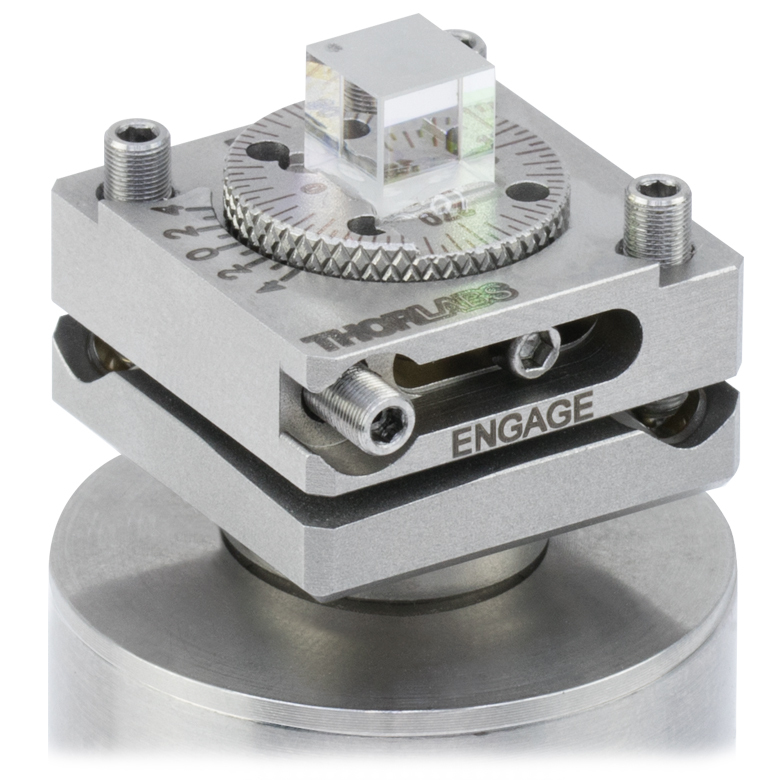 This means that both CW and pulsed damage thresholds must be compared to the laser beam to determine whether the optic is suitable for your application. LIDT in energy density vs. pulse length and spot size. For short pulses, energy density becomes a constant with spot size. This graph was obtained from . The energy density of your beam should be calculated in terms of J/cm2. The graph to the right shows why expressing the LIDT as an energy density provides the best metric for short pulse sources. In this regime, the LIDT given as an energy density can be applied to any beam diameter; one does not need to compute an adjusted LIDT to adjust for changes in spot size. This calculation assumes a uniform beam intensity profile. You must now adjust this energy density to account for hotspots or other nonuniform intensity profiles and roughly calculate a maximum energy density. For reference a Gaussian beam typically has a maximum energy density that is twice that of the 1/e2 beam. You now have a wavelength-adjusted energy density, which you will use in the following step. Beam diameter is also important to know when comparing damage thresholds. While the LIDT, when expressed in units of J/cm², scales independently of spot size; large beam sizes are more likely to illuminate a larger number of defects which can lead to greater variances in the LIDT . For data presented here, a <1 mm beam size was used to measure the LIDT. For beams sizes greater than 5 mm, the LIDT (J/cm2) will not scale independently of beam diameter due to the larger size beam exposing more defects. Use this formula to calculate the Adjusted LIDT for an optic based on your pulse length. If your maximum energy density is less than this adjusted LIDT maximum energy density, then the optic should be suitable for your application. Keep in mind that this calculation is only used for pulses between 10-9 s and 10-7 s. For pulses between 10-7 s and 10-4 s, the CW LIDT must also be checked before deeming the optic appropriate for your application. Please note that we have a buffer built in between the specified damage thresholds online and the tests which we have done, which accommodates variation between batches. Upon request, we can provide individual test information and a testing certificate. Contact Tech Support for more information. R. M. Wood, Optics and Laser Tech. 29, 517 (1998). Roger M. Wood, Laser-Induced Damage of Optical Materials (Institute of Physics Publishing, Philadelphia, PA, 2003). C. W. Carr et al., Phys. Rev. Lett. 91, 127402 (2003). N. Bloembergen, Appl. Opt. 12, 661 (1973). In order to illustrate the process of determining whether a given laser system will damage an optic, a number of example calculations of laser induced damage threshold are given below. For assistance with performing similar calculations, we provide a spreadsheet calculator that can be downloaded by clicking the button to the right. To use the calculator, enter the specified LIDT value of the optic under consideration and the relevant parameters of your laser system in the green boxes. The spreadsheet will then calculate a linear power density for CW and pulsed systems, as well as an energy density value for pulsed systems. These values are used to calculate adjusted, scaled LIDT values for the optics based on accepted scaling laws. This calculator assumes a Gaussian beam profile, so a correction factor must be introduced for other beam shapes (uniform, etc.). The LIDT scaling laws are determined from empirical relationships; their accuracy is not guaranteed. Remember that absorption by optics or coatings can significantly reduce LIDT in some spectral regions. These LIDT values are not valid for ultrashort pulses less than one nanosecond in duration. A Gaussian beam profile has about twice the maximum intensity of a uniform beam profile. However, the maximum power density of a Gaussian beam is about twice the maximum power density of a uniform beam, as shown in the graph to the right. Therefore, a more accurate determination of the maximum linear power density of the system is 1 W/cm. The adjusted LIDT value of 350 W/cm x (1319 nm / 1550 nm) = 298 W/cm is significantly higher than the calculated maximum linear power density of the laser system, so it would be safe to use this doublet lens for this application. As described above, the maximum energy density of a Gaussian beam is about twice the average energy density. So, the maximum energy density of this beam is ~0.7 J/cm2. This adjustment factor results in LIDT values of 0.45 J/cm2 for the BB1-E01 broadband mirror and 1.6 J/cm2 for the Nd:YAG laser line mirror, which are to be compared with the 0.7 J/cm2 maximum energy density of the beam. While the broadband mirror would likely be damaged by the laser, the more specialized laser line mirror is appropriate for use with this system. This scaling gives adjusted LIDT values of 0.08 J/cm2 for the reflective filter and 14 J/cm2 for the absorptive filter. 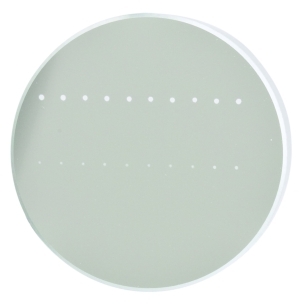 In this case, the absorptive filter is the best choice in order to avoid optical damage. Consider a laser system that produces 1 µs pulses, each containing 150 µJ of energy at a repetition rate of 50 kHz, resulting in a relatively high duty cycle of 5%. This system falls somewhere between the regimes of CW and pulsed laser induced damage, and could potentially damage an optic by mechanisms associated with either regime. As a result, both CW and pulsed LIDT values must be compared to the properties of the laser system to ensure safe operation. If this relatively long-pulse laser emits a Gaussian 12.7 mm diameter beam (1/e2) at 980 nm, then the resulting output has a linear power density of 5.9 W/cm and an energy density of 1.2 x 10-4 J/cm2 per pulse. This can be compared to the LIDT values for a WPQ10E-980 polymer zero-order quarter-wave plate, which are 5 W/cm for CW radiation at 810 nm and 5 J/cm2 for a 10 ns pulse at 810 nm. As before, the CW LIDT of the optic scales linearly with the laser wavelength, resulting in an adjusted CW value of 6 W/cm at 980 nm. On the other hand, the pulsed LIDT scales with the square root of the laser wavelength and the square root of the pulse duration, resulting in an adjusted value of 55 J/cm2 for a 1 µs pulse at 980 nm. The pulsed LIDT of the optic is significantly greater than the energy density of the laser pulse, so individual pulses will not damage the wave plate. However, the large average linear power density of the laser system may cause thermal damage to the optic, much like a high-power CW beam. Thorlabs offers a variety of mounting solutions for our beamsplitter cubes. 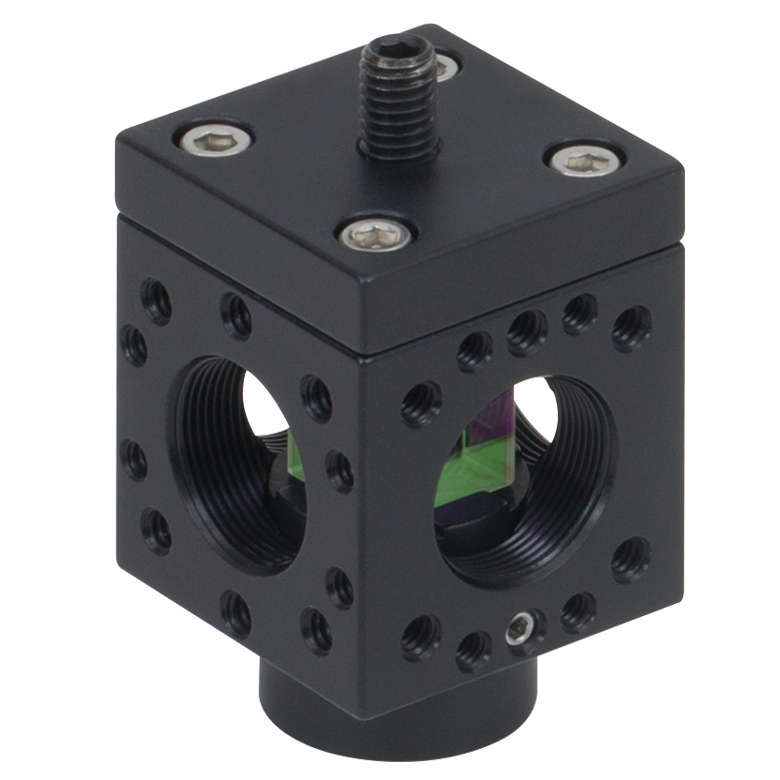 The mounts below allow our cubes to be post-mounted or integrated into our 16 mm or 30 mm cage systems. Post-mountable solutions are compatible with our Ø1/2" Posts as well as Ø1" Posts with 8-32 (M4) taps. The BSH20(/M) cannot be mounted to an optical table. These photos illustrate two possible combinations. Any combination of cage cube, clamp, and platform is possible. Can you please issue an RoHS conformance for this product? 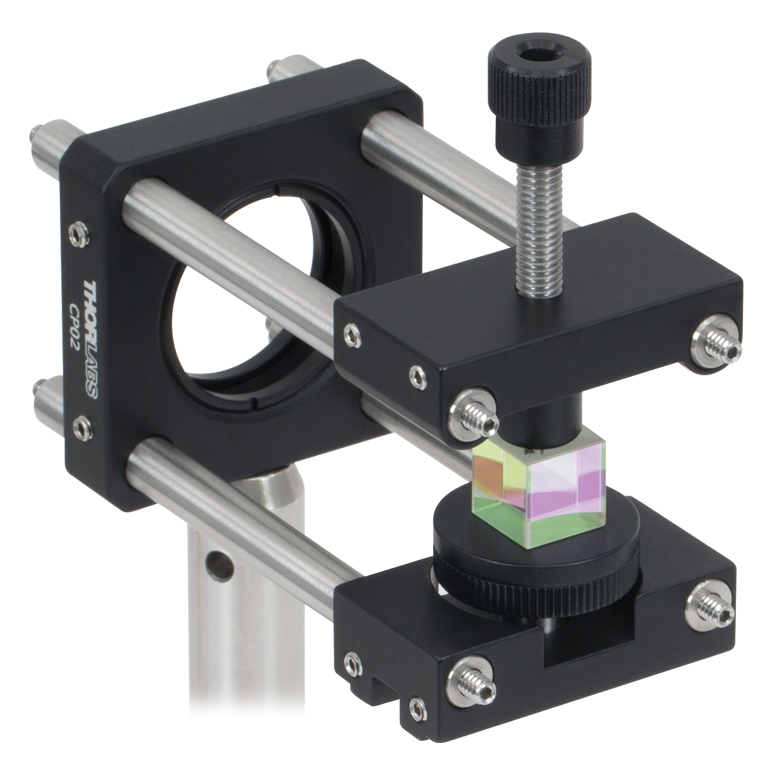 Can you provide a Zemax file for the BS031 Beamsplitter? Hello, thank you for contacting Thorlabs. Unfortunately, we are unable to provide Zemax files for these beamsplitters at the moment. I will reach out to you directly with information on how to create a simple Zemax beamsplitter model. Thank you for contacting Thorlabs. At the moment we do not have any data regarding the phase shift of the output beams of our non polarizing beamsplitters. We can possibly measure the retardance at discrete wavelengths, I will contact you directly with more information. Thank you for contacting Thorlabs. Either direction can be used for these beamsplitters, the difference in performance will be relatively small in terms of the R:T ratio. Best performance however is as indicated with the arrows where your beam is incident on the BS coating layer before passing through the cemented layer. Hi, I am looking for a Beam Splitter (50:50) which can add two diverging light sources; one from a slit lamp bulb and other from a green laser diode (L520P50) for my experiment. Can you suggest me which beam splitter is best for my application to focus the added light? hi. I used bs025, and found that the beam mode after reflection is distorted. I am using the pulsed laser(0.3mJ(when repetition rate is 100kHz), 10kHz repetition rate, 5ns. Is it damaged, or the mistake from thorlabs? Thanks. Hello, thank you for contacting Thorlabs. We're sorry to hear about the issues you are experiencing with your beamsplitter. It is possible that the beamsplitter has been damaged by your beam, but it is hard to say for certain since we currently only have testing for Damage Thresholds under very specific conditions that don't quite apply to your situation (0.25 J/cm2, 532 nm, 10 ns, 10 Hz, Ø0.341 mm, 50:50 Beam Splitters Only). I will reach out to you directly to troubleshoot/discuss this further. Is it possible to get this cubes vacuum compatible (10-6 mbar) ? Hello, thank you for contacting Thorlabs. Unfortunately, we do not currently have an optically clear vacuum adhesive to use with this cube. I will reach out to you directly to discuss alternative beamsplitters which are vacuum compatible. Hi. what is your specification for the direction of the transmitted beam? (imperfect parallelism will result in beam deviation which is roughly independent of BS orientation). Thanks, Tomer. Hello, thank you for contacting Thorlabs. The Maximum Transmitted Beam Deviation is 5 arcmin. I will contact you directly to discuss your application. I would like to know if you have any beamsplitter that can be used for 355nm. As I reviewed the beamsplitters, none of them work good for 355nm. Do you have information about the phase retardation of the the two polarization for light passing through the NP BS (50/50)? In other words, what would happen to circularly polarized light passing though it? Response from Bweh at Thorlabs USA. We don't currently have this as a specification. We will do some measurements and I will follow-up with you regarding typical values. From the curve of power thru put on cube BS about 7 % will be lost. Is that because of coating material or cement? Response from Bweh at Thorlabs USA: Yes it is largely absorption from the coating material (~6.5%) and the rest from cement and prism substrates. Hi, regarding the specs of the BS: if I understand correctly, an on-axis ray would be diverted by less than 5arcmin if the BS is positioned exactly perpendicular to the optical axis? is the beam deviation measured for each individual BS? what is the parallelism of the faces? Thanks, Tomer. Response from Bweh at Thorlabs USA: Yes the statement you made regarding the deviation is correct. 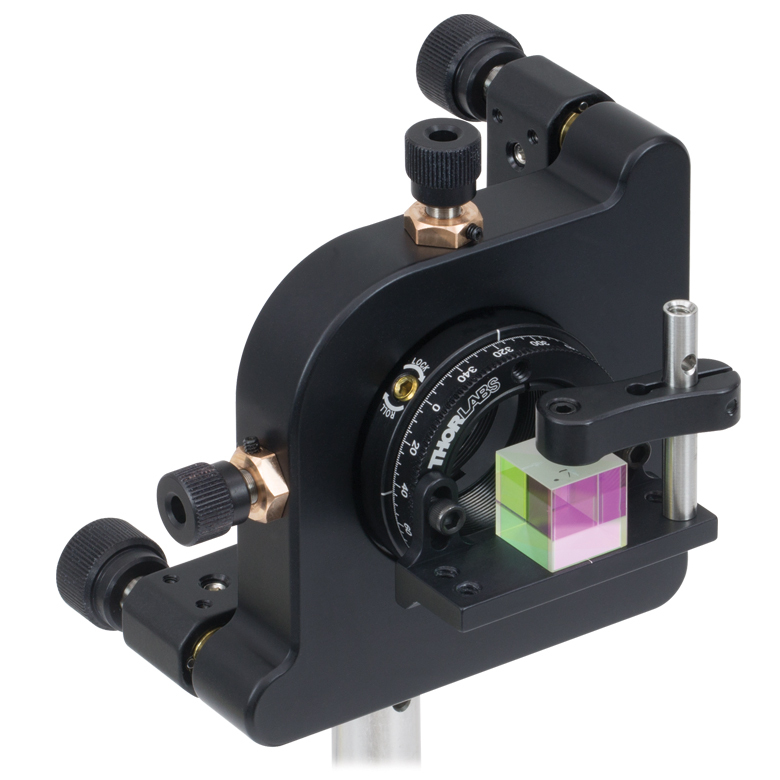 We don't currently specify the parallelism of the surfaces nor do we measure the deviation for every beamsplitter but, we can measure both parameters for your beamsplitter if requested during the quotation process. For BS013 as well as other cube BS, only transmission is provided, not reflection. Both of which are needed in my case. Can Thorlabs provide the reflection vs wavelength data as well, just like the case of pellicle BS (avoided as it is fragile)? I cannot let reflection be (1 - transmission) as the absorption and scattering in a cube BS is significant (~7% as stated in the % Power Throughput in the "Lab Facts" tab) to me. It is only reasonable that both reflection and transmission data are provided for all BS types. Thank you. Response from Bweh at Thorlabs. We recently acquired the proper accessories to measure these in our spectrometer so I will provide this to you by email. Hello, Could I have the experimental values of the plots for BS025 and BS028? Could be for s, p and non-polarized light? Thanks. Response from Mike at Thorlabs: Thank you for your feedback. We are currently in the process of adding the raw data files for all of our non-polarizing beamsplitters to the website. I have contacted you via email with the data files for the BS025 and BS028 cube beamsplitters. How would the split ratio be if the light propagetes not in the recommended way? For example: How is the division ratio when the light incident on the upper surface and not on the marked left one? Would the reflection still be 10%? Response from Tim at Thorlabs: There is generally some difference on reversal as the reflected beam will be on the optical cement side where more absorption and scattering will occur (as opposed to first incident on the beamsplitter side). This will change your split ratio. I’ve contacted you via email so we can continue this discussion. In your webpage it is quoted "Damage Threshold (Tested for 50:50 Cubes Only): 300 W/cm" for CW lasers. Is the damage threshold of the 70:30 (and 30:70) also the same? Thanks in advance! Response from Chris at Thorlabs: Thank you for your inquiry. Unfortunately we have not tested the damage threshold for the 70:30. My initial thoughts are the limiting factor will likely be the epoxy and this would mean the damage threshold would be the same. However, we'd like to have a more definitive answer to provide you, so I will try to have this tested in the coming weeks and added to the specifications provided on the web. We will send this to you directly as soon as possible as well. last month I bought Beamsplitter 50:50 (BS013) and HeNe Laser (HNL150L). I try to measure the power using power meter, and I got the transmission power only 32.9% and the reflection power only 8.69% from the BS013 (input uses HNL150L). so is it normal? because I expect the transmission 50% and reflection 50%. Thank you. Response from Tim at Thorlabs: Thank you for contacting us. The specifications with tolerances can be found in the drawing. These numbers are not typical and I will contact you to discuss the measurement setup and order so we can diagnose the problem. Response from Tim at Thorlabs: Thank you for your interest in our BS010! We can provide many custom optics, and a member of our Germany office will contact you directly to discuss this quote with you. We would like to buy non-polarizing cube beamsplitters (BS010 in particular) without the antireflective coating. Is that possible and if yes, what would the estimated cost and the time for delivery to Germany be? 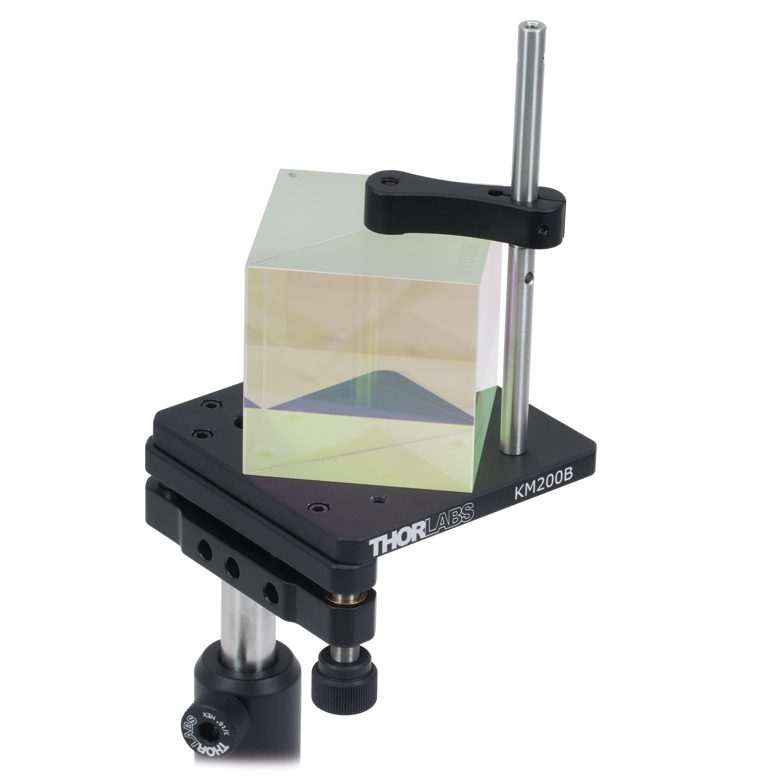 Response from Tim at Thorlabs: Although we cannot reveal the exact layers of the beamsplitter coating, we would be more than happy to work with you to provide any of the specifications that you may be trying to derive from this information. I will contact you directly to provide more information. We are using the beamsplitters (25.4mm at 632.8nm wavelength). Please tell us the detailed parameters of the thickness and the refractive index of BS coating and cement layer,respectively. 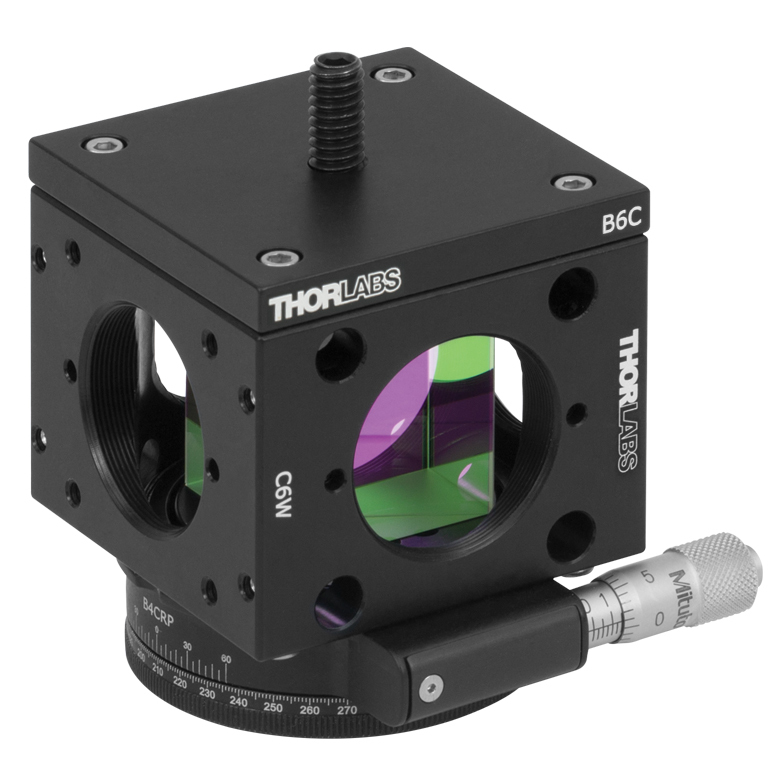 Response from Tim at Thorlabs: As our optics team has been working on other projects and offering new products, this product is not ready for release. I am discussing your interest with our optics department and will contact you with more details. regarding: "Response from Javier at Thorlabs to natalia.denisenko: The reason why the light polarized at 45 degrees undergoes a change in the polarization is because the beamsplitter coating introduces a phase delay, causing the output polarization to become elliptical. We are currently looking into offering polarization independent/preserving beamsplitters. I will gladly inform you about the progress of this product." can you provide phase shifts for p and s components, for rays passing through and being deflected by the beamsplitter? has there been any progress with the polarization-maintaining idea? Response from Tim at Thorlabs: Thank you for your feedback! The tolerance on the reflected beam exiting the cube is currently +/- 20 arcmin of 90 degrees. I am discussing your feedback with our production team to see if there is a way we can tighten up tolerance or offer, as you suggest, tip/tilt control. 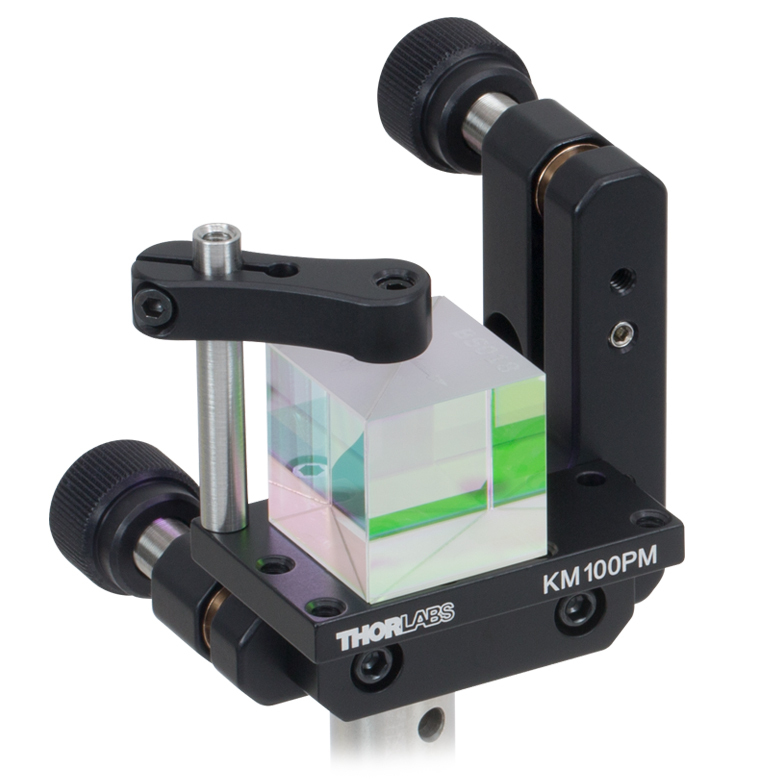 As a note, we do offer tip/tilt control via post mounting with our KM100B(KM200B) and PM3(PM4). Thank you again for your feedback so that we may continue to improve our products! I've ordered several of the Cube Mounted models, and while I really like the idea, the tolerances on the mounting aren't great. Usually the beam ends up tilted a small fraction of a degree above or below the axis of the incoming beam. This makes them problematic in large systems, since the beam deflection can become excessive. Would you consider making a mounted version with tip/tilt controls or at least some other way to compensate for the finite mechanical tolerances? Response from Buki at Thorlabs: We do not have a tested value for the CW damage threshold but you can use 10 W/cm^2 as a guideline. We post the pulsed damage threshold on our website because it is a tested value. Please contact us at techsupport@thorlabs.com if you have further questions. Response from Buki at Thorlabs: As an update on the last post, we are currently developing the polarization independent beamsplitters and they should be released soon. We will provide more updates as we get closer to the release date. Response from Buki at Thorlabs: Thank you for using our online feedback tool. The CM1-BS013 is a mounted version of the BS013 so it will introduce a phase delay similar to what the previous poster experienced. We will contact you with an update on the polarization preserving beamsplitter. Tried to find Max CW/Average Power Density for these optics, did i miss it. Your wrote previously on this feedback page (in response to the question from natalia.denisenko) that THORlabs is looking into offering polarization independent/preserving beamsplitters. Can you offer such polarization-insensitive beamsplitting cubes? 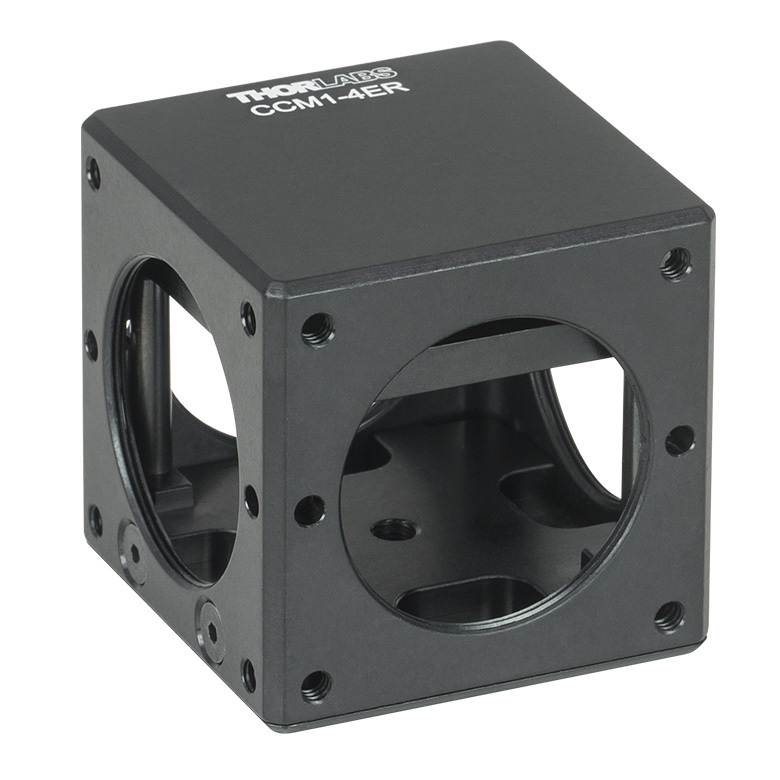 CM1-BS013 is marketed as "Cube-Mounted Polarization-Insensitive Beamsplitter". Is it really Polarization-Insensitive, meaning that linear polarization at 45º will not deteriorate upon reflection from the cube? Or is it a 'normal' BS013, which will introduce a phase delay and polarization distortion? Response from Buki at Thorlabs: We have contacted you with a graph and will look into making this information available on our website. Can you give specs on splitting ratio for your non-polarizing beamsplitters BS014 (700-1000nm range), at the specific wavelength of 810 nanometers? (catalog says 15% tolerance but I understand that this number is for the entire range). Thanks, Miguel. Response from Javier at Thorlabs to Tomer: Thank you very much for contacting us. The CW damage threshold of 10 W/cm^2 is offered as a guideline, so we post the pulsed damage threshold instead, since this is the value that has been actually tested. Also, the laser induced damage on this optic beamsplitter initiates on the cement bond between the two prisms that make up the cube. Please contact us at techsupport@thorlabs.com if you have any further questions. Response from Laurie at Thorlabs to the unidentified poster from 1-28-2011: Thank you for your comments concerning the "x" on these optics. It is a natural question that we should have addressed in our web presentation. You will find that we have updated the overview tab of this presentation to prevent confusion for other customers who are likely wondering the same thing. Thanks for the taking the time to help us improve the information we provide, and I apologize for the inconvenience we may have caused by not just having the information readily available. Response from Javier at Thorlabs to last poster: Thank you for submitting your inquiry. The "x" mark indicates the recommended entrance direction of the beamsplitter. Please contact techsupport@thorlabs.com if you have any further questions. I am using these beamsplitters. all of them have a "x" mark on one side of the splitter. What is the significance of this "x" mark for combining laser beams for a mach zehnder interferometer. Response from Tor at Thorlabs to stripa3: Thank you for your interest in our BS013. Currently, we do not have any damage threshold information for these optics in the ultrafast regime. What is the damage threshold for this beamsplitter if it is used with pulsed femtosecond laser with a few tens of megahertz repetition rate. Response from Javier at Thorlabs to yuj210: the AR coating on the BS cube beamsplitters yields a reflectivity of < 0.5% at each surface, which minimizes interference effects resulting from secondary reflection as the transmitted ray exits the beamsplitter. Unfortunately, it is not easy to avoid this effect altogether with a cube; it would be necessary to use a wedged surface. I would recommend using a plate beamsplitter such as the BSW10 (http://www.thorlabs.com/NewGroupPage9.cfm?ObjectGroup_ID=4807). The back surface of this BS is wedged at 30 arcmin, so it eliminates interference effects. Regarding AR coating in a cube BS, I can understand that beam reflected on a entrance surface is suppressed when beam enters into BS. My question is what about reflectance occurring when beam escape the BS. At the end face, there are also transmitting(escaping BS) beam and reflecting beam just like the entrance face. Now Im concerning the beam reflected at the end face of the BS. At 4th face of the BS (1st is beam entering, 2nd and 3rd are beams escaping) I think Ive got interference of two beams reflected from each end faces, and I have to eliminate this interference. Response from Javier at Thorlabs to guillaume.lepert07: The AR coatings on the BS series cubes have an average reflectivity of < 0.5% over their specified band. I am worried about etalon interference within the BS (we currently have such a problem with a plate BS). What is the residual reflectivity of the AR coating? (wavelength of interest 780 nm). Thanks. Response from Javier at Thorlabs to natalia.denisenko: The reason why the light polarized at 45 degrees undergoes a change in the polarization is because the beamsplitter coating introduces a phase delay, causing the output polarization to become elliptical. We are currently looking into offering polarization independent/preserving beamsplitters. I will gladly inform you about the progress of this product. We use a BS014 to combine beams at 850 nm, both linearly polarized: one polarized at 90º and the other at 45º. We observe that the 45º polarized incident beam becomes elliptically polarized at both cube outputs, which is undesirable in our setup. What could be the reason for this behaviour? Furthermore, we would like to know the refraction index of the internal diagonal surface coating, and if this index is lower than that of the N-BK7. How large is internal loss in BS014 beamsplitter cube? I.e., when summing the two output beam powers together, how much of the input beam power is lost? A response from Ken at Thorlabs to roland.thuenauer: The damage threshold is 10 W/cm^2 for CW, 10 mJ/cm^2 for 10 ns pulsed laser. I would like to know the damage threshold (W/cm^2) of the non-polarizing beam splitter cubes BS007 & BS010. Thank you for your presentation feedback. Our ongoing dialog with our customers is extremely important to us. We have tried to incorporate your comments into the presentation of this product. If you have further feedback, please feel free to make additional comments. Thorlabs' portfolio contains many different kinds of beamsplitters, which can split beams by intensity or by polarization. 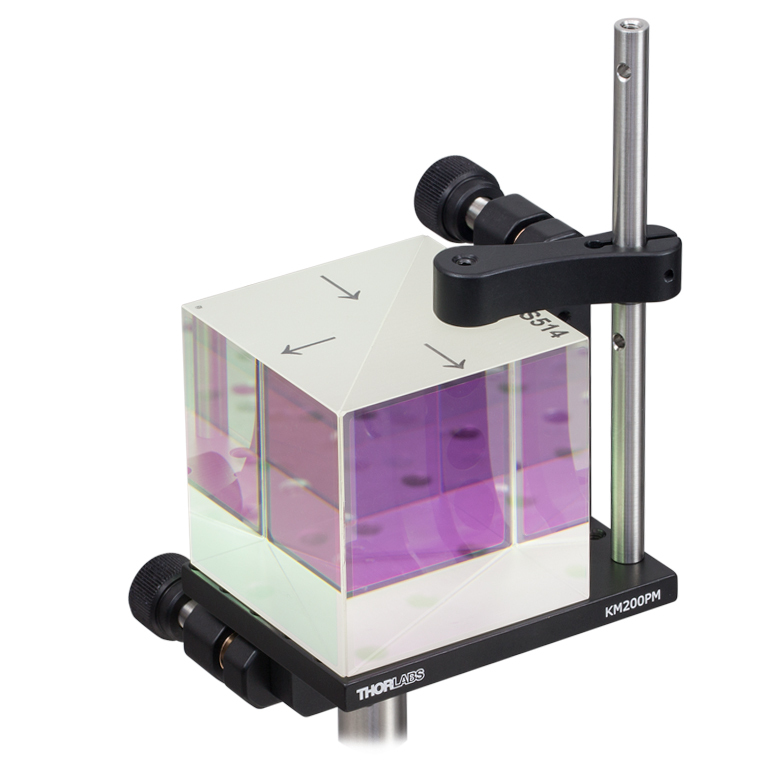 We offer plate and cube beamsplitters, though other form factors exist, including pellicle and birefringent crystal. Many of our beamsplitters come in premounted or unmounted variants. Below is a complete listing of our beamsplitter offerings. To explore the available types, wavelength ranges, splitting/extinction ratios, transmission, and available sizes for each beamsplitter category, click More [+] in the appropriate row below. 25 x 36 mm, and Ø2"
CaF2 for IR 1.0 - 6.0 µm 50:50 Ø1/2", Ø1", 25 x 36 mm, and Ø2"
2.0 - 8.0 µm Ø1/2", Ø1", and Ø2"
ZnSe for IR 1.0 - 12.0 µm 50:50 Ø1"
7.0 - 14.0 µm Ø1/2", Ø1", and Ø2"
45° Ø1", 1" x 1", and Ø2"
Ultrafast with Low GDD 600 - 1500 nm 20:80 Ø1"
5 mm, 10 mm, 1/2", 20 mm, 1"
20 mm, 1", and 2"
5 mm, 10 mm, 1/2", 20 mm,1"
10 mm, 20 mm, and 1"
10 mm, 1/2", and 1"
Mounted in a protective box, unthreaded ring, or cylinder. Available unmounted or mounted in a protective box or unthreaded cylinder. The data above is relative to the power of the incident beam. Note that some light will be absorbed by the beamsplitter coating. The shaded region indicates the specified operating wavelength range. The data shown here is typical, and run-to-run variations will occur within the specifications given. BS040 Customer Inspired! 10:90 (R:T) Non-Polarizing Beamsplitter Cube, 400 - 700 nm, 1/2"
BS025 10:90 (R:T) Non-Polarizing Beamsplitter Cube, 400-700 nm, 1"
BS052 Customer Inspired! 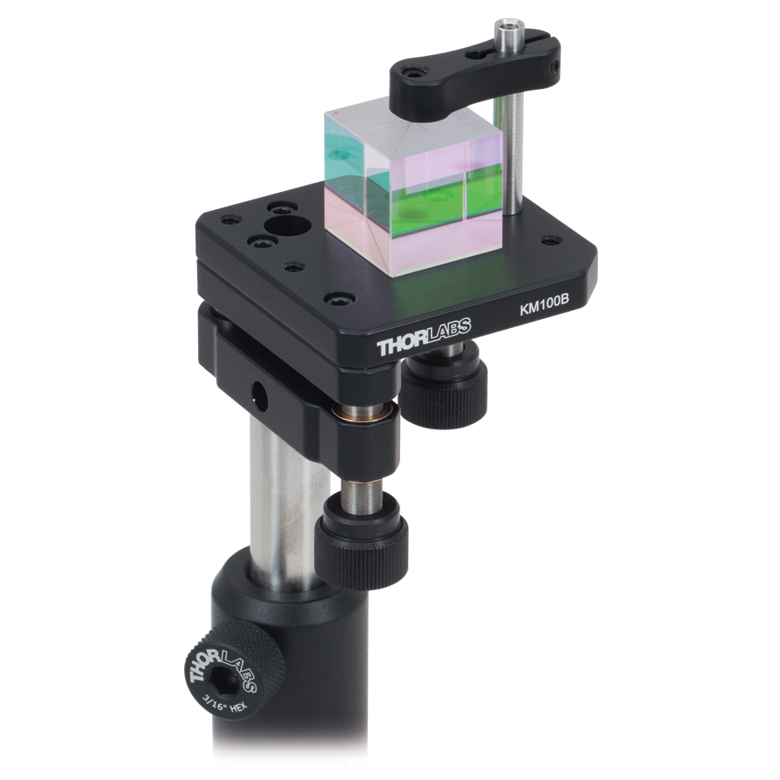 30:70 (R:T) Non-Polarizing Beamsplitter Cube, 400 - 700 nm, 1/2"
BS019 Customer Inspired! 30:70 (R:T) Non-Polarizing Beamsplitter Cube, 400 - 700 nm, 1"
Cube Side Length 5 mm 10 mm 1/2"
(12.7 mm) 20 mm 1"
BS004 Customer Inspired! 50:50 Non-Polarizing Beamsplitter Cube, 400 - 700 nm, 1/2"
BS013 50:50 Non-Polarizing Beamsplitter Cube, 400 - 700 nm, 1"
BS031 Customer Inspired! 50:50 Non-Polarizing Beamsplitter Cube, 400 - 700 nm, 2"
BS061 Customer Inspired! 70:30 (R:T) Non-Polarizing Beamsplitter Cube, 400 - 700 nm, 1/2"
BS022 Customer Inspired! 70:30 (R:T) Non-Polarizing Beamsplitter Cube, 400 - 700 nm, 1"
BS073 Customer Inspired! 90:10 (R:T) Non-Polarizing Beamsplitter Cube, 400 - 700 nm, 1/2"
BS028 90:10 (R:T) Non-Polarizing Beamsplitter Cube, 400 - 700 nm, 1"